When it comes to arranging furniture in a living room, most people really don’t think much about balance and that sofas should talk to chairs. Furniture is placed in the room with no thought about making it easy for seated people to have conversation. The two topics covered in this post are balance and grouping furniture. Balance ..In my 2-27-2011 post titled Interior Decorating is all about Equal Balance I talk about, when you place something on one side of a room, you must counterbalance it with some other elements, that together are about the same height, width, and visual weight on the other side of the room opposite it. Let’s say you have a 90 inch three cushion sofa. To counterbalance it, directly across from / opposite it, you could place another 90 inch sofa, that would be equal balance. You could also counter balance the 90 inch sofa with two club chairs and an end table between them that together measure about 90 running inches. Illustration 1A shows 2 three cushion sofas counterbalancing each other. Illustration 1B shows a 3 cushion sofa being counterbalanced by 2 club chairs (or other styles of chairs) with an end table and lamp between them. Illustration 2a takes it a bit further. In 2A you have a “U” shaped arrangement of furniture facing a fireplace. A 3 cushion sofa counterbalances the hearth, and a 3 cushion sofa on the left is counterbalanced by two upholstered chairs with end table placed between them. Illustration 2B is a compressed version of 2A. In 2B you have the 3 cushion sofa that anchors the grouping (it is the largest piece). The sofa is flanked on both its left and right by upholstered or occasional chairs. Two other chairs, or even upholstered benches or stools are across from it. In the groupings just shown, notice how the furniture is placed kind of close together and all the different sofas and chairs are facing each other, one way or another. The different arrangements would make it so seated people either faced each other, or were along side each other for easy conversation. Sofas Talking to Chairs ..To often people place sofas and chairs too far apart, kind of like how you place furniture in a ballroom, everything is around the outside of the space with an empty center. With furniture placed like that, seated people have to talk loud to be heard from one side of the room to the other. In Illustration 3A we are starting to expand on / add more chairs to the first grouping (1A and B, 2A and B) that I started with. In Illustration 3A the two anchor pieces are the 3 cushion sofa and 2 cushion loveseat. Notice how to the right of the sofa, in front of the fireplace are two chairs and an upholstered bench; those pieces counterbalance the loveseat and chair and ottoman opposite them, at the far end of the room. Now look at the 2 cushion loveseat. It is flanked on one side by a round ottoman used for seating, and the ottoman is then counterbalanced by a chair. The different groupings in this space provide adequate seating for just 2 people or many. If a person is sitting on the sofa or loveseat, another person has a place to sit close by on a chair right up next to them. The chair placed right up next to the sofa makes it easy for a Sofa to talk to a chair. Illustration 3B is an expanded version of illustration 2A. 3B shows 2 three cushion sofas that are anchoring the room, by a fireplace. The sofa opposite the fireplace is being counterbalanced by the fireplace with two chairs by it. The sofa to the left is counterbalanced by the two chairs and end table on the right. Illustration 4A is an expanded version of illustration 2B. The anchor is the sofa with two upholstered chairs flank it on both the left and right. An upholstered bench which counterbalances the sofa was added next to the coffee table for extra seating. In Illustration 4B I have left out any kind of sofa or loveseat. Four upholstered chairs are placed in the center of this space in front of a fireplace. This kind of grouping would be perfect in a small living room / parlor off of the main entry hall. The grouping of 4 chairs would also work well as part of multiple seating areas in a large space. 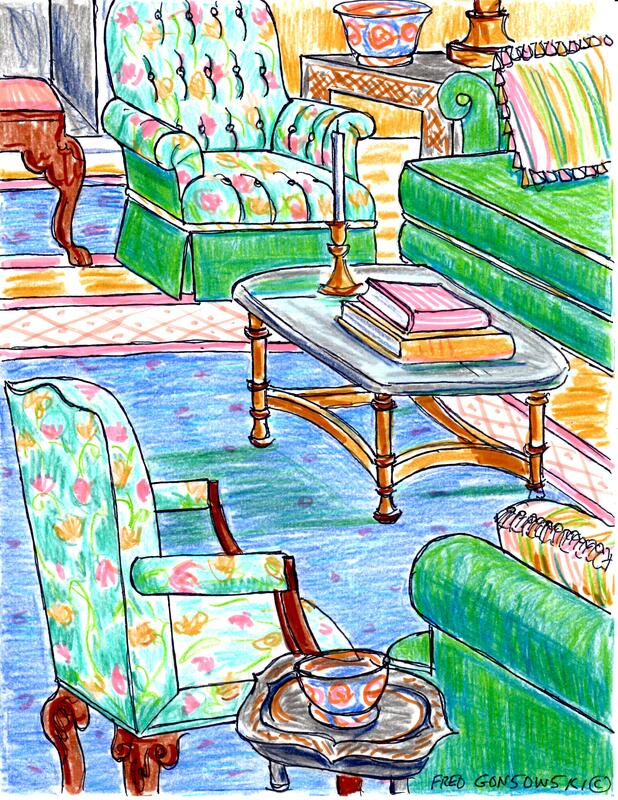 In this post I have tried, with all the different illustrations, to get you to think about making groupings of furniture in a room for good conversation. I hope my illustrations inspired you. Now I want you to go through interior decorating magazines and look at how professional decorators have arranged / grouped sofas and chairs. Finally before purchasing any furniture for your home (sofas, chair, etc) get the dimensions of the pieces for height, width and depth; the furniture store will provide you with that. Take those measurements (width and depth) and tape newspapers together to make patterns / templates showing the size of the sofa or chairs exact dimensions. Lay the templates on the floor where you are thinking about putting the furniture to see how it fills in the floor space. A sofa or chair that looks average sized in the cavernous furniture show room might look enormous in your house. Also, get measurements so you can see if the furniture you want, fits through doorways, can make it around corners, or can fit in an elevator if you live in a high-rise. This entry was posted in Arranging Living Room Furniture, Interior Decorating Principles, San Francisco Chronicle / eHow references or resources. Bookmark the permalink. This is a very awesome post – so well done and thought out – the illustrations and the reasoning written out so clearly is appreciated. When you have 2 couches facing eachother with a round rug between them, what is the best style coffee table ..round, oval or square.? I have really, truly the hardest living room to place and arrange furniture – long, kind of narrow, fireplace, ceiling beams not centered with the fireplace, a wall where the TV must go opposite the fireplace…it’s really, really difficult. If you want a challenge email me! Thank you for your reply. The room is rather like a rectangle but on the slim side in length. 3 windows are at one end. A wall with a piano against is at the other end. in the middle of one wall is a working fireplace/mantel. Opposite the fireplace is a mid century buffet(?) with a flat screen TV atop(I know it should be mounted on the wall but budget ..) I have the two couches in the middle of the room facing each other with a round rug (Thomas Paul 8′ round cream and chocolate Seed rug) between them. They flank the fireplace and buffet so you can sit across from each other and talk or watch TV . I just wanted to give you a correct description of the room. With that in mind, that the two couches flank the fireplace, the oval table would not therefor go the length of the room right? a table would go between the 2 couches in front of the fireplace so an oval table would be set on the round rug going across the the room not the length of the room. what do you think of a 36″ diameter Platner coffee table http://www.mattblatt.com.au/Coffee-Tables/Replica-Warren-Platner-Coffee-Table.aspx?p1941c12? the couches are sectional I have separated and placed across from each other http://www.lillianaugust.com/online/inet_tear_sheet?item=1228287 and in slate grey fabric. You are asking..why take the sectional apart? The sectional fit in a smaller room but in the room it has to go in presently, to be kept as a sectional, there is an awkwardness that is created because the room cannot handle the section together in the middle of the room and when placed with one piece along the wall opposite the fireplace, there is too much room and no one seem to like sitting in the nook where the two couches meet except the beagle, Andy Walter. so for entertaining it is no conducive to people relaxing and talking. Do you think the kind of modern couches with the Thomas Paul Rug would go with the Platner Coffee table? Or is that all mixed modern overkill? Write a book! DO You tube videos! You are so thoughtful and can really communicate. Thank you very much for responding. Your suggestions are perfect. I never, ever comment on blogs but this post was so incredibly helpful. 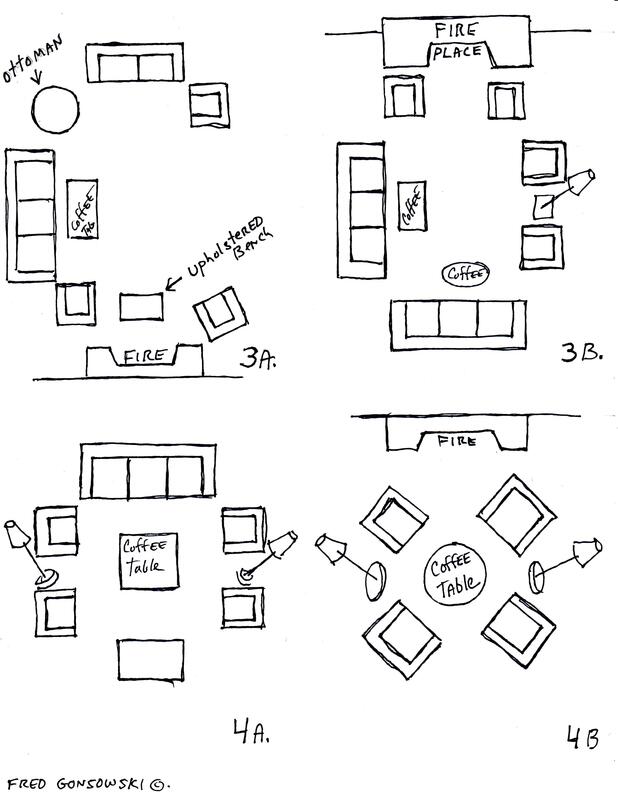 I’ve been trying to figure out a furniture arrangement for my lovely but empty living room for months with no luck. I stumbled upon your site and…2A it is! I wanted a floor plan in mind before I started looking for furniture and now I have one. Thank you! Hi there Erin, and thank you for writing a comment to me. When you have time, if you are interested, look at all the other different interior decorating topics I’ve written. You will find them on the right side of your screen under Categories. Look for interior decorating principles, you might see something that might catch your eye, by ever reading the titles of the posts. Again thanks for viewing, and come back again. Your blog is extremely helpful. I have been struggling with furniture placement in our living room, and I have found several of your blog posts useful. Still not sure what to do, but I will ruminate on what you wrote and tackle the project. Thanks! It seems that the main point is that seating arrangements should make it easier for anyone to talk to each other. Good read. Hi there Cheryl, sorry to say but I’m only giving inspiration to my readers, through my articles, not doing floor plans for them. If I did it for one person, I would have to do for everyone, and it would be too big a project, and you know this blog is rally only a hobby for me ;-} Have you read my post It’s easy to arrange Furniture in a Square Living Room, some ideas that will inspire you? in it I tell my readers about making a graph of one inch squares that represents one square foot of space in a room, and them about making template which represent their furniture and playing around with them in the space. At the end of each of my furniture arranging posts are companion posts, that further cover the subject. You can also look at all the decorating articles under Categories on the right side of the screen, and click on Interior Decorating Principles. All the decorating topics are there, and make sure at the bottom of the page to click on older posts/more (or whatever it says) and continue scrolling through the different topics I’ve covered. Sorry to not be of help, but thank you for your comment. Good luck with your project. Thank you for replying so promptly. I totally understand and will scour the site for articles to help me. Love your articles. I guess if I could rephrase my question I would say-my room is rectangular , narrow, 25ft. By 12ft. One narrow end is all bay window (east) 3 four ft. wide windows. There is a small set of French doors at the half way mark of one long side ( north) and another door at the the north west end. The west wall is blank. The south wall has one five ft. wide window centered at the dnrm. end of this 25 ft. Long room. In the dining area I would like to put a round dining table, buffet, sideboard. In the livingroom area I would like to arrange a 7ft. sofa with 2 round side tables, 2 classic sway back chairs, spool chair and ottoman and a 24×48 upholstered ottoman. How can I add more weight to the dining room end of the room without adding furniture? Would a wall of wallpaper work, or a rug, or a bold paint color on that one end wall? OK Cheryl here we go…First of all I want you to read an early post I wrote called Interior Decorating is ALL about Equal Balance. People don’t know it, but if you can get the premise of that post, everything in interior decorating is based off of it. Secondly if I got your floor plan right, I want you to put the sofa (centered on the east side of the room) out from, but in front of the bay window. I want you to leave enough space for you to walk along side the south-east side of the sofa and walk into the window. On the north-east side of the sofa I want you to put one of the end tables. On the north side of the room next to that one end table, that is next to the sofa I want you to put the two sway back chairs next to each other. On the south wall opposite the two chairs, I want you to think about putting the spoon chair and put the other end table next to it. Aim the spoon chair toward the sofa. Put the big ottoman in front of the sofa, and take the small one and use it as a bench opposite the sofa. You could also put a 6’x9′ or 8’x10’area rug in front/ or under the sofa and it will help define that part of the room. At the dining room side do the table and sideboard, with the sideboard on the west wall. Over the sideboard put a big mirror with large frame, or large painting, giant wall plaque, tapestry, or whatever so the combined height of the sideboard and whatever you hang over it is about the same height as the height of the of the curtains behind the sofa across the long room, opposite it. You with the sideboard and art object are counterbalancing the sofa and all the furniture on the wall opposite it. You could also paint the wall behind the sideboard the color of the sofa, or the strongest color in the sofa, or the two sway back chairs, so you are taking the color from one side of the room and moving it to the other. I hope some or all of this comment helps you. Hello, I am amazed both by how helpful and responsive you are. I apologize in advance for my long post! I am one of those who is struggling with a long narrow living room (12×22) in a very small 1850’s farmhouse. My future living room is currently two small rooms and I will be taking down the wall between them so the long sides of the living room (22′) will face east and west, the west side leads to a deck facing ocean and the east to my garden, both sides will be getting doors. I was thinking perhaps a single door to the west side deck and a single door opposite on the east side to capture the view through and through. My doors are currently in the center of the room (east /west walls) which makes furniture placement difficult and I am thinking of moving them both down towards the south end of the room to not have so much traffic through the middle. I am considering also adding a set of french doors on the east wall but I am struggling with keeping access open to the doors while at the same time providing enough seating, perhaps two chairs could live in front of doors with enough space between them to walk through? The north end will have a wall of windows but no doors and the south side has a 30″ wall (in from the west side) and an 8″ wall (from east side), the middle of the south end is otherwise completely open to a hallway leading to a kitchen and bath so it is a major traffic area which cannot be accessed on it’s perimeter due to the adjoining walls. I am committed to changing most furniture as well as all windows and doors so I am completely open to suggestions for both furniture and door/window placement. My challenges include: how to seat a group of 6 for comfortable socializing, add in a t.v. (maybe in a corner cupboard on the south/west end so the door on the west side would rest in front of the t.v cupboard) but that will require at least two comfy chairs positioned for t.v. viewing or ones that swivel… I’ve found that my current arrangement, 7′ couch with glass coffee table in front of it, two chairs opposite couch and angled in towards center with small side table between them and two little wooden stools on either end of glass coffee table, doesn’t work well for a group of 6 and leaves a very tight walking space in front of chairs. I am also searching for couches and chairs that are both comfortable and not more than 30″ wide as my current 3′ couch and 3′ chairs overtake the very limited walking space in front of chairs. Would you recommend a sectional couch? The only furniture I plan to keep is a glass topped coffee table (2′ x 4) & an antique workbench 6′ 6 L / 26″ deep / 33″ H which I was thinking about centering on the north wall. No other parameters except for lot’s of windows to be added east, west and north. I know this is a big one to tackle but any additional help you can provide would be most appreciated. Hi there Miss Stella, I think you spoke too quick about my quick responses. I am beyond busy at this time and don’t have time to read the comments or give an opinion. When my over-busy schedule slows down again I will try to address your problem. Hi there Ms. Stella, finally I have a moment to read your long and complicated description of your living room. First of all I want you to read my post titled Arranging Furniture in a 12 foot wide by 24 foot long Living Room. Secondly with blue painter’s tape, I want you to tape off the areas, on the walls, where you are thinking of adding the new doors and windows, showing their actual size/shape, so you can see how the new openings will look when they are finally installed. You will have to kind of be flexible with your placement of the doors and windows, as they do have to go between studs that are sixteen inches on center, (and you , having an old house that will probably be off). I want you to also tape off the floor in your room with the painter’s tape showing where the new walls will be placed. By doing things like that you can see exactly how things will kind of look in the end. Finally, I’m all for sectional and modular furniture, as you can group many single pieces together to form full sized sofas and make seating groups, also consider chairs with exposed legs and open arms or even armless chairs, because if you can see through them, or under them, they will look visually lighter. Good luck with your project. Fred, so thankful I found your site when looking on Pinterest for living room arrangement. Lots of very helpful ideas. I would love to see your ideas for rooms that have difficult traffic patterns. 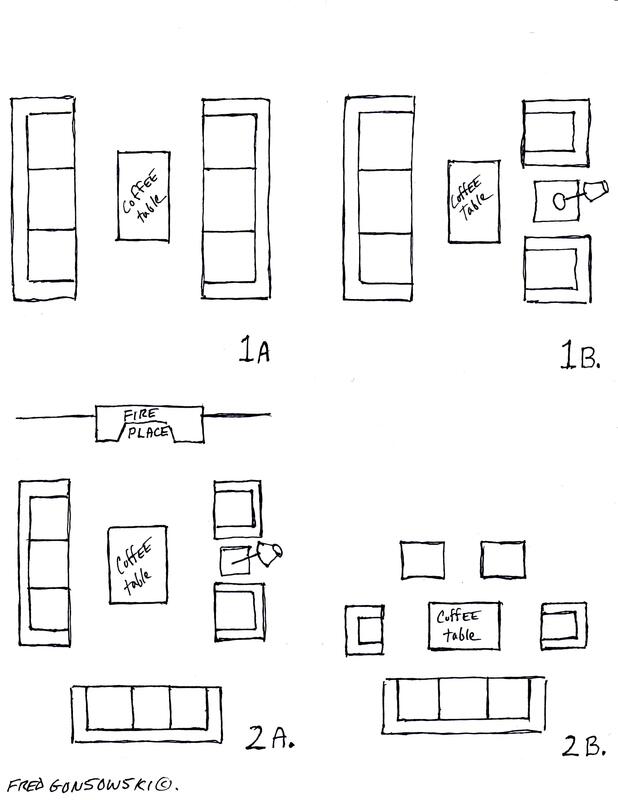 For example, a room with entries that bisect a room – one entry on the northeast corner, and one on the southwest corner. Hi there D. When I get back to writing articles I will do something inspired by your comment. Look for it sometime in October. My question is about seat height. Two chairs in my room have seat heights of 17 inches. I saw a beautiful sofa that I am thinking of buying, and I would like to place it in the room so that the two chairs angle facing towards the sofa. However, the seat height of the sofa cushions is 18-½ inches. Should the seat heights be the same? Here’s another trick to make sure fabrics work together: Don’t know if there’s a blue hiding under that gray or a green undertone in the brown? Then take the fabric sample and place it (in good lighting) on a large piece of blue or green, etc. fabric. If the underlying color is in your sample, then it will pop out! Excellent way of explaining, and nice piece of writing to obtain facts regarding my presentation subject matter, which i am going to convey in college.